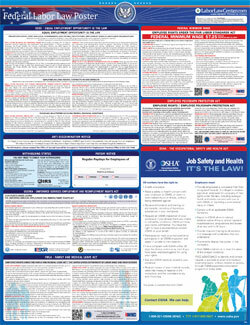 The Employee Polygraph Protection Act (EPPA) (Spanish) is a miscellaneous law poster by the Federal Department Of Labor. This poster is mandatory for some employers, including employers subject to the employee polygraph protection act that employ people who speak spanish. This poster, written in Spanish, describes protections that Spanish speaking employees have from getting lie detector tests in the workplace or as a way of pre-employment screening. Protection from lie detector tests is not absolute. For those who work under Federal, State and local governments are exempt from this ruling as well as those employees who are reasonably suspected of involvement in any workplace incident that resulted in economic loss to the employer. It appears you don't have a PDF plugin for this browser. Please see the link below to download federal-eppaspan.pdf. derechos establecidos por la Ley. actividades relacionadas con la seguridad nacional. ocasionado daños económicos al empleador. respecto a las pruebas de polígrafo. derecho a entablar sus propios pleitos en los tribunales. de pre-empleo o durante el servicio de empleo. EMPLEADOS Y LOS SOLICITANTES DE EMPLEO LO PUEDAN VER FÁCILMENTE. DEPARTAMENTO DE TRABAJO DE LOS EE.UU.